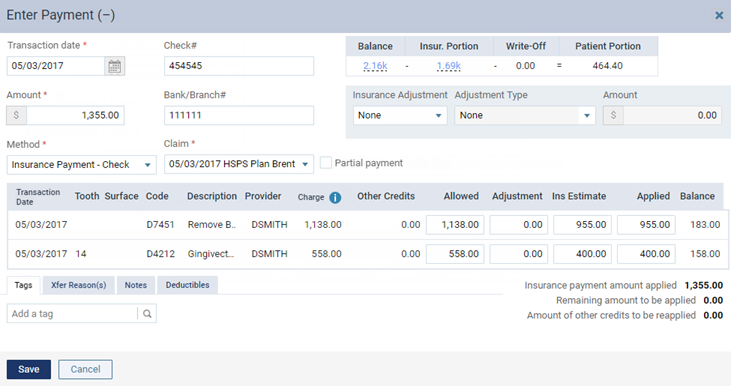 You can post an insurance payment to a patient's ledger. The Enter Payment (-) dialog box appears. Select the Type of payment received from the insurance carrier: electronic insurance payment or insurance payment by check. Enter the payment details, such as the check number, and select the applicable claim. Reference # - The reference number of the electronic funds transfer. This option is available only if the payment type is an electronic payment. Additional payment(s) expected later from insurance - The check or electronic payment amount is less than the allowed amount or the amount billed to the insurance carrier. Claim - The claim that the payment applies to. The selection cannot be changed after you save the payment. For a write-off (credit adjustment), from the Insurance Adjustment list, select Write-off. Select an Adjustment Type. Then, type an amount in the Adjustment column for each procedure that the adjustment applies to. By default, a procedure's Adjustment amount is the Charge minus the Allowed amount (the insurance plan's UCR fee). For a refund (charge adjustment), from the Insurance Adjustment list, select Refund. Select an Adjustment Type. Then, change the refund Amount if needed. By default, the refund Amount is the payment Amount. If the refund amount is less than the payment amount, the difference must be applied to one or more procedures. Also, any amount you enter for a procedure's Adjustment amount will not be posted as part of a write-off adjustment. Allowed - By default, this is the insurance plan's UCR fee. Ins Estimate - By default, this is calculated from the coverage table, remaining deductible, and remaining benefit of the patient's insurance plan. Applied - By default, this is the amount of the payment that is being applied to the procedure up to the Allowed amount. The payment amount is applied automatically to the first procedure listed and then to subsequent procedures until the payment amount is used up. For each procedure, the Balance appears for your reference. This is the Charge minus the sum of the Other Credits, Adjustment, and Applied amounts. The Insurance payment amount applied is the sum of the amounts in the Applied column. The text turns red if the amount is less than or greater than the payment Amount. To post the payment, this amount must equal the payment Amount. The Remaining amount to be applied is the payment Amount minus the Insurance payment amount applied. The text turns red if the amount is greater than zero. To post the payment, this amount must be less than or equal to zero. The Amount of other credits to be reapplied is the sum of all credits in the Balance column. A credit (negative amount) appears in the Balance column for a procedure if the sum of the Applied and Adjustment amounts is more than the sum of the Charge and Other Credits amounts. Enter a Note regarding the payment as needed. On the Deductibles tab, change the amounts of the payment that are being applied toward any deductibles for Major, Preventive, Basic, and/or Ortho procedures as needed (for example, if the amounts differ from what is on the EOB that you receive from the insurance carrier). If you are posting a payment to a primary claim, a secondary claim is created for you automatically, and the Claim Created message appears and informs you of that. To view the secondary claim immediately, click (or tap) Open Secondary Claim; otherwise, click (or tap) OK. If you get one check from an insurance for multiple patients, the best way to add this check is to put in a payment per individual. The check will list what procedures the insurance paid for. Put the applied amount per procedure.